In cameras of this class it is customary to make a number of exposures on a single plate that may be later developed and any or all of the individual exposures selectively enlarged from the negative. This is how Wing described this "plural exposure" camera in his 1914 patent. Yet by this time most of the camera industry had moved on to lightweight sheet and roll film, and the first experimental 35mm cameras were a couple years away. That and the overall design are reasons this camera is so odd. It raises the question of why bother making a design that could be perceived as 'old school' in 1914? It's probably one of the reasons the camera was never named, marketed and sold. 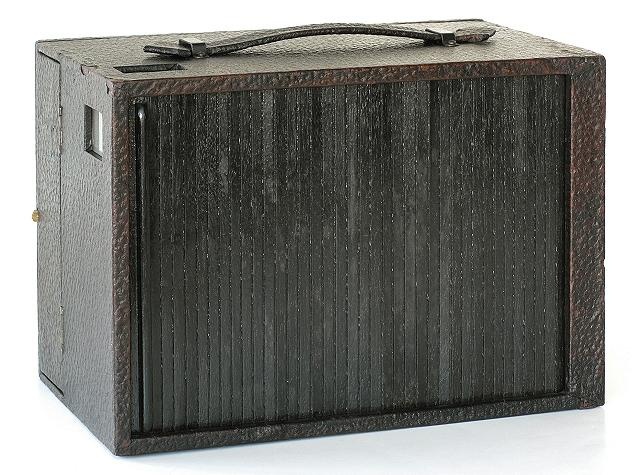 This prototype is quite rare and not widely known. Only two were built by Harvey T. Wing, son of the legendary American daguerreotypist, camera builder and politician Simon Wing; who created a stunning variety of apparatus most of which were designed to make multiple images on a single plate. According to the late collector and historian Mike Kessler. Harvey T. Wing. Revere, Massachusetts. 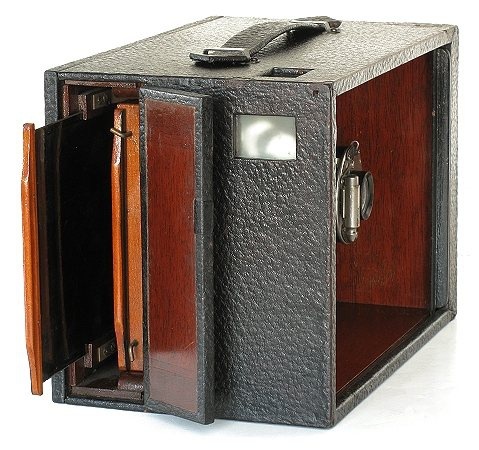 Opened, the 4 x 5 inch format camera greets the photographer with a highly polished wooden interior. By 1903 Simon turned over the operation of the Charlestown, Massachusetts factory to his son Harvey, who kept things going until around World War One when the company finally closed for good. In later years of the company's operation, that camera business had fallen off and their main product was a line of photographers card mounts. One obvious reason for the company's decline was the advent of roll film. Wing's cameras were designed for glass plates but the public was hooked on lighter, more efficient film cameras. Harvey Wing, however, felt that there was still a market for the right design; consequently on January 20, 1914, he was granted patent number 1,084,687 on a clever little glass plate camera. 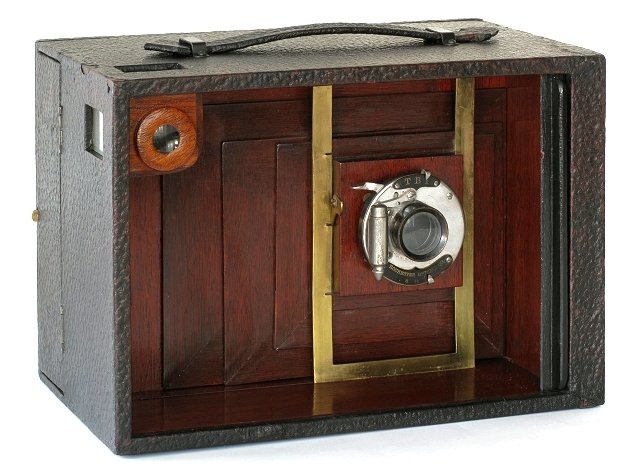 Just a little larger than the 4 X 5 glass plates it used, it was covered in black seal-grain leather with a tamboured wood face which opened to reveal a miniature polished wood multiplying camera based on their popular "New Gem" penny picture camera of 1899. With its fixed focus lens and simple T.B.I shutter, the camera could make nine images on each of the two plates in its holder. Eighteen photos from a light, handheld box was a much more manageable number than the 60 to 100 shots that came in the typical string-set Kodak. According to Kessler, Harvey Wing constructed one complete prototype camera and a second incomplete prototype (this camera) to experiment with. Both cameras were discovered in the 1970s as part of the original Wing-Nilsson family estate. In looking at the two cameras (the complete version is in another private collection), they have two different brands of T.B.I. shutters. Additionally, the other prototype also differs in having brass registration hardware (matching the patent illustration Figure 5) mounted to the interior base to regulate and lock the horizontal lens board movement for multiple images. Unlike that camera, the hardware is not present and there is no screw hole in the wood to indicate any sort of mechanism was ever mounted. This might mean that Harvey was still tinkering with the mechanics and had not gotten around to adding it. Close examination of the camera uncovers two design surprises. The first has to do with the reflex viewer located at the upper left corner of the body. It is fixed to the body yet there are two ground glass viewing ports cut into the body for landscape and portrait orientations. It ends up that the viewer is a clever design in which the mirror can be rotated 90 degrees by grasping and turning the round wood fixture at the front. Another interesting feature is found at the rear of the camera where plate holders are loaded. There are two thin slots just behind the plate holder mount to store a dark slide. It is a clever thought that helps avoid accidental loss of the dark slide. There is no clear answer to why Harvey didn't produce the camera and we might never know. It's an intriguing concept and no other camera was like it. And as Mike Kessler said, "this was the final Wing!"